quote me from page #1 : Suicide is beginning to look Tastier than Mom's Apple Pie ,,,, Right ? " I wrote a song once called where have all the Oswalds gone. It never really came to fruition. Song I'd like to write is : " Where have all the Clinton's Gone ,, Off to the Gas Chamber every one "
Fascinating thing you posted.... seen it before and it is a "horse in the bed" msg to a radical conservative pastor in Tempe AZ.... STEPHEN ANDERSON. THORN was killed .... but that pic is of STEPHEN ANDERSON. Anderson is most hated for being against the gay lifestyle. The creator of that graphic was likely a militant gay. 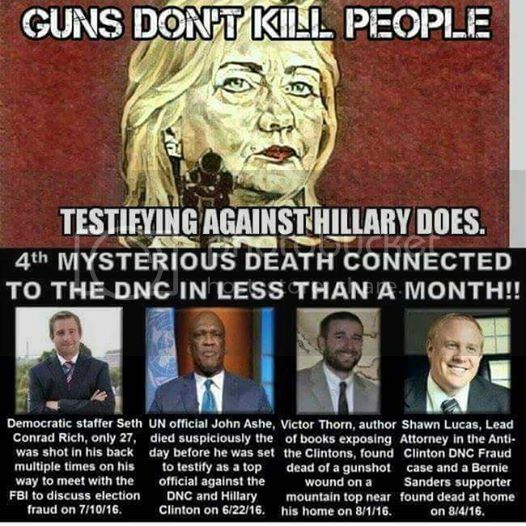 Though all four of these men were murdered.... the graphic was also created to discredit the idea that the DNC and CLINTON FOUNDATION were murdering people. The politically active gays will know the pic of Stephen Anderson. (05-20-2017, 02:51 PM)Cynicalabsurdance Wrote: quote me from page #1 : Suicide is beginning to look Tastier than Mom's Apple Pie ,,,, Right ? " There were far more than four. Well.... if true.... this is explosive by itself.